In my last episode Sachin Kalbag spoke about The Joshua Tree by U2. Actually...it was the only song and album about which he had nothing much to say. That is not because there's not much to say...but because there's no need for anything at all to be said about it. Whatever you say about this iconic epic album is not enough. Tonight, if you are one of the few people who've not heard the album, that shall change. First up, I have the complete album in one video for you. Listen to the studio version of the album from start to finish. After that I have every song from the album for you separately. Some of the videos are the official videos of the songs...and some are live performances. Over the last few decades U2 has been universally thought of as the best arena-rock band. If you've not seen them perform live (and if that is the case, what rock are you living under?! )...check out some fantastic performances of the songs from The Joshua Tree. 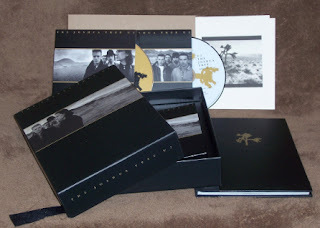 A couple of years ago, I had picked up the Limited Edition box set of The Joshua Tree, which even today is one of my most prized possessions. - The 3 disc box-set format contains The Joshua Tree CD, the bonus audio CD, and a Bonus DVD. - This package also includes a 56 page hardback embossed book, featuring previously unseen Anton Corbijn photos, handwritten lyrics by Bono and liner notes by Bill Flanagan, Bono, Adam Clayton, Brian Eno, Daniel Lanois, Anton Corbijn, Steve Averill, David Batstone, René Castro and a special essay by The Edge. - An embossed envelope contains five more Corbijn photos, printed on 5" x 7" sheets of textured, "antique" paper. - The Bonus DVD contains a rare live performance of U2 Live from Paris - filmed at the Hippodrome de Vincennes in Paris, on July 4 1987, on the European leg of The Joshua Tree tour. - The Joshua Tree is U2's fifth studio album. - It was produced by Daniel Lanois and Brian Eno, and was released on 9 March 1987 on Island Records. - The album won Grammy Awards for Album of the Year and Best Rock Performance by a Duo or Group with Vocal in 1988. - The Joshua Tree is one of the world's all-time best-selling albums, with over 25 million copies sold. Do check out all the songs. This is such an incredible album. Deserves to be heard from top to bottom.